At my previous job, we implement a modified version of the MVVM pattern using C++. Our model followed a hierarchical structure where each item owns zero or more other items. We wanted the View Model to hear about everything that happened in the Model, but we didn’t want the Model to know about the View Model. As far as I know, C++11 doesn’t have any signaling, messaging, or event handling built in, so we decided to use boost::signals2 to allow communication where the sender of a message doesn’t need to know anything about the listener(s). When hooking up boost::signals2, we used boost::bind to connect member functions as listeners (i.e. slots, subscribers, etc.). A quick search turned a great StackOverflow question on a similar topic, but that didn’t cover automatic propagation. A reference to the instance that the function should be called on (but only if that function is a member function). The first parameter that goes into the function (if applicable). The second parameter that goes into the function (if applicable). These are what usually trip me up a little. What the above example means is pass through the first argument. 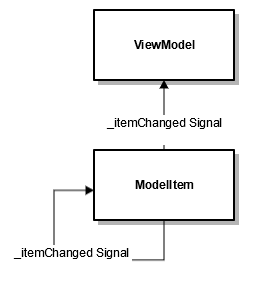 As a simplified example, let’s pretend that ViewModel needs to know when something in Model has changed, but we don’t want Model to be dependent on ViewModel, as shown in the UML below. This allows us, for example, to add more view models without having to change anything about the Model. The following code shows the use of a tree-style “ModelItem” class, where each ModelItem owns zero or more other ModelItems. Signals are automatically connected and sent. Here are the details of the classes used. class ModelItem; // Forward declaration for the typedefs below. // These wrappers were written because it doesn't seem that boost::bind works with the signal's overloaded () operator. // Hooks up this ModelItem's signals to listener. The above code was compiled with Visual Studio Community 2015. If anyone wants to play with the above code, let me know and I’ll put it up on GitHub. I used raw pointers in this code but if this were production code I would use shared pointers instead.